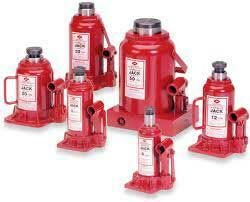 Hydraulic Bottle Jacks, also called buffalo jacks or hydraulic bottle or trolley jacks, are used for lifting cars, trucks and buses. Despite of dealing with authentic manufacturers in the industry, we make sure that all our Hydraulic Bottle Jacks are quality checked by experts. We are capable of providing Hydraulic Bottle Jacks in bulk quantities. Our Hydraulic Bottle Jacks are available at affordable rates.